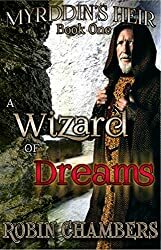 A Wizard of Dreams is book one in the Myrddin’s Heir series by Robin Chambers following extraordinary Gordon Bennett and his invisible protector Zack. From the first moment he learned to speak, at five months, Gordon’s always had his parents and Zack. His Alter-Ego, and invisible to others, Zack teaches Gordon all kinds of facts the rest of the world doesn’t know. Gordon even develops powers of telepathy, telekinesis, and dream walking. But that’s only the first part of the adventure. A Wizard of Dreams is a good read. A little slow to start, but we see just how spectacular Gordon is by the end. You can get A Wizard of Dreams on Amazon or by visiting the Myrddin’s Heir website. There’s several more in the series after this one, but I haven’t read them. Author Robin Chambers is a Rave Reviews Book Club member, so you can check out his work there.